You just know you're in for a good laugh when an article is about knitting in the 80s! 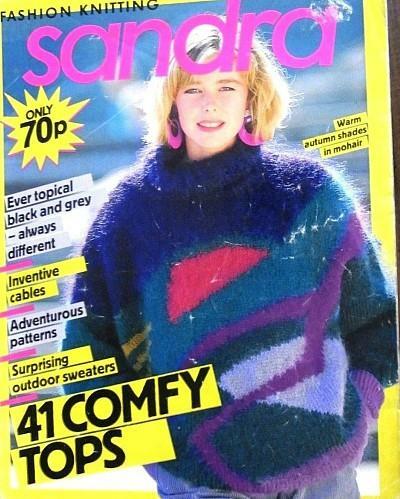 The first image features a mohair sweater from Sandra fashion kitting magazine in January 1987. Just about everyone had a fuzzy mohair jumper back in the 80s - I certainly did! 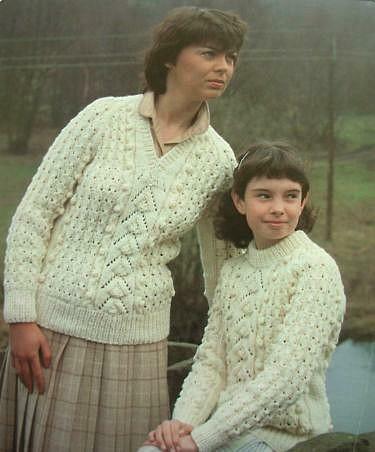 Receiving a knitted aran sweater with bobbles from your gran was the highlight of Christmas day. Every year you would be forced to try it on in front of her, and every year the arms were at least a foot too long! My Mum always came up with the excuse that my gran was a "loose knitter". 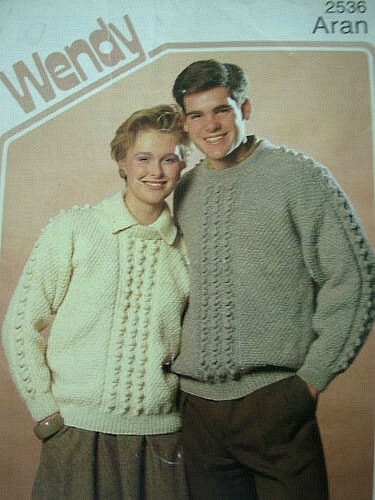 His and hers Aran sweaters - 1980s Wendy knitting pattern. This couple appear to be very pleased with them, at least! This image is painfully brown and cheesy! This sweater from 1980 features a very early example of geometric patterns (sort of!) which became very popular during the decade. Maybe it was this very magazine that started it all? Hmm, I think not! The old saying "blue and green should never be seen!" springs to mind for this sweater - yuk! As we move through the decade you will notice how the fashion becomes ever more colourful, although it really doesn't make these jumpers any more wearable. Back in the eighties, we certainly weren't afraid of bold colouring, as this jumper shows. Red, yellow, blue, grey and purple make a wonderful combination don't you think? This cover is about as 1980s as you can get! 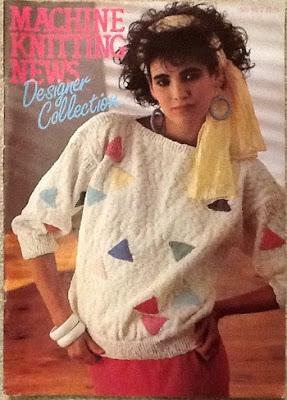 Geometric patterns (particularly triangles) were extremely fashionable and this lady is wearing the ultimate 80s jumper, with accompanying white plastic bangles and big loop earrings. Yes, even WHSmith were into knitting back in the day and were trying their best to persuade us all to knit a jumper just like this one back in 1986. It has very gorgeous 80s patterning! This very lovely jumper would have been the perfect choice for a children's TV presenter. It even has a touch of aztec styling which became fashionable in the 80s. Now, that's quite a steep price rise from 65p to 90p between 1986 and 1987. Mind you, that colourful sleeveless sweater looks a darn sight better than the first one on the page and has a touch of Esprit-influenced styling. This is a truly bizarre knitting pattern! Why would anyone want a matching cushion to go with their outfit? And who's ever heard of wearing a cropped string vest with knitted fingerless gloves? Seriously, just who goes out on a hot summers day wearing a knitted string vest over a T-shirt while carrying a matching cushion? We go from bizarre to downright disturbing. This is a genuine cutting from a knitting pattern for leg warmers and a matching top. Is the third person in the white a guy or a gal?